It can certainly feel like a meltdown! At a time we have less active volunteers than ever before we have more amazing things on the go than ever. Groups running four days a week with groups like photography and creative writing coming back soon. Also new groups starting, Drum Circle for one, it’s looking like it will be a five day week for S2C to be able to help people who need us in our unique way. At the moment most of our energy is going in to finish displays for the Comic Art Festival Windows Trail. They all look great and once again we hope to promote S2C and the various groups we run and raise the profile of these and the artists working on them. Alongside this the Transformations project is coming together with just a few artworks still to be brought in. (Guilty! mine is getting there.) The work being brought constantly surprises and amazes me. There is such a diverse mix of styles, media and responses. Hanging the exhibition will be a challenge with such a wide range of sizes and shape to sit alongside but I look forward to doing it. The end results should be stunning. Keep an eye out for events around this. A preview evening, exhibition opening, poetry readings, books and more. The group were mostly busy with comic art fest prep but some were working on transformations work while others were working on a collaborative piece based on Marc Chagalls Circus painting. The comic group were working on Lloyds window at the photography studio which will be featured for the comic festival, the artwork will now be stuck to foam board and cut out. An interesting mix of paintings by the DeafArt group this week. Some colourful and textured image ideas. The group all helped getting ready for The Comic Art Festival Windows. More birds done, some stringing ready to hang too. We made a grid from sticks to hang from the ceiling to hang the birds from. Karen was making a giant book for it. On the Kentmere Ward this week the group helped out with Space2Create’s Comic Art Fest window making more birds for the display. A really busy session today with visitors, meetings and art. Jane led the session with the group experimenting using salt and watercolours. By laying down quite we’re paint then throwing salt over it creates interesting texture as the salt absorbs the paint. Some really effective pictures were created. And of course there was the usual supportive positive vibe as the group worked. Some people carried on from last week and experimented with the Brusho powders creating animals. Others were productive working on projects for the Comic Art Festival windows. One of the things I constantly have to deal with at Space2Create is the absolute belief by people that they cannot “Do” art. For those on their first session it’s usually an instant dismissal of anything they might produce. Usually by the end of their first session they are covered in paint and on their third picture when the end of the session comes round and they don’t want to stop. What really annoys me in art is people who cant bring themselves to say well done to somebody. Art and creativity go wrong in this world at school as soon as it needs to be judged. For some that’s fine as they can achieve the required results. For those that can’t it kills creative activity for them. 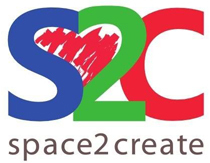 How often somebody comes to Space2Create and it’s the first time in thirty, forty years they have been deliberately creative since they left school. Its a shame because those same people are in a bad place. Creativity cant stop that or cure it but it sure makes it a lot easier to live with. I have immense respect for my Grandfather. He taught me much, mainly to respect and celebrate others. The harder it was for somebody to do something the greater their achievement when they reached their goals. Those words “Ay up, that’s reet grand is that” would banish the darkness and send me away glowing. He was a man of very few words but when he did speak every single word was packed with intentional meaning. “Ay, Thas done a grand job ere”. Great session this with lots of exploration and fun. We used Brusho ink powders to create a range of patterns as the starting point then worked into them with pen. The finished pieces look great. The group worked on two activities today. Firstly finishing off the backdrops for the comic art festival window by printing a flock of birds on top. Then they also used the brusho inks to create a base on which to work picking out details in pen. Good session. On the ward we were working with cards, postcards and envelopes, using a variety of media to create different items of correspondence. Jane led the session this week. The group used a template to cut shaped lengths of paper in different colours then weaved these together to creat little balloons which looked really effective. Others carried on making Comic Fest Birds and one person was knitting too. Today we worked towards getting our windows set up for the comic festival, drawing up the characters for the band featured in the Photography Studio and setting up the model for Youdells window. The WellArt group took the brusho ink powder pics a step further today by trying to create images of animals. A rough pencil outline was used as a guide then the powdered ink colours spread. After adding water with a dropped a range of techniques were used. Pieces of card to drag, plastic spoons to swirl, straws to blow and even picking up the paper and allowing the ink to run. After dabbing the excess away and drying some added pen lines. There are moments when, like today for example, I am sat on a Sunday morning working voluntarily in the Unit doing admin for S2C wondering why on Earth am I doing it. A few people understand the hard work put in by a small number of people to make the organisation function, but maybe not enough. As a totally voluntary organisation (at the moment) S2C is dependant on goodwill. I may not be rich enough to donate to charity, I can’t cure cancer, I don’t have answer to child poverty, I am unable to stop the wars going on around the world. I can organise and manage, be creative, educate, inspire, encourage and be nice. For me volunteering allows me to make a difference to somebodies life. It’s also about repayment. People put in time to save me when I was in trouble so now I am returning the favour. Whatever motivates you to volunteer you have to care. There are hundreds of charities desperate for volunteers to give time and to care. I often feel that an hour spent volunteering for something you care about is worth far more than sticking coins in a box. It’s a win win situation. The charity gains from your time, expertise, caring and you benefit by the reward of knowing you have helped, the new friends you make, th skills you develop as well as that massive buzz you get when you see what a positive effect you can have on the life of somebody who is vulnerable. The group carried on with getting things ready for the Comic Art Festival. We started working on the backdrop to the Nevi Sport Window. The Unity Group continued working on the background for the Nevi Sport Window display. They finished the first from this morning and started a second piece. They also started experimenting to print a flock of birds over the top of them. Technically there was no group today as there was no volunteers to lead session but some came in anyway and did their own thing. That was helping get display ready for Nevi Sport. The background d was finished, some more birds made and Chris started making the giant book. Anna Jordison dropped round her transformations artwork and Shannon from Blackwell brought round the tiles from the Yellow Wallpaper Project bow the exhibition is over. Antony Dixon and Greer still run the DeafArt Group for us over at Castle Street Deaf Centre every Thursday Morning 10-12. It’s just they are really bad at sending us pics! The group is great fun and a chance for people in the Deaf community to relax, socialise and create some art. They have been trying all sorts including wax relief and printing. A mixed bag as some people carried on with birds for the comic art fest. The main session was exploring lines to create forms and patterns. An interesting range of outcomes as people tried different styles. Liz was using a melted wax method to produce amazing images and we had yet more deliveries of transformations artwork. And what else would you do with the cut out scraps but turn them into mini paper sculptures! Organ Donation, Stunning Transformations and Gallery Goodness! This week at S2C we highlighted the campaign by Mayor Chris Hogg to make Kendal an Organ Donor Town. We talked about the subject in groups and pointed people to where they could find out more information and sign up to the register. We have often found people we work with reluctant as they feel the illness and medication they deal with would make their organs unusable. We were able to advise them how this is not always the case and that a surprisingly large number of parts can be used from a donor. A steady trickle of artwork has been dropped in at our unit over the week for the Transformations project. Every artist who has brought work to us has said how inspiring it was to create from the poems they had been given The knowledge that the writer is going through such difficult times and the role creativity is playing in their recovery adds an extra power and dimension to the work. Not only that, without exception, all the work that has arrived so far has been absolutely stunning. The writers who have had chance to see the work based on their poems have been overwhelmed by it. It is such an honour and massive esteem boost for this to have happened to them. We will be holding an exhibition when we have everything together then hope to hold some reading events before we auction the work to raise funds. On Friday the WellArt Group went to the St Ives exhibition at the Abbot Hall Art Gallery. Once again the good relationship between S2C and Lakeland Arts showed how working with larger arts organisations can benefit both. The people who came along all took a great deal from the visit. One had not been there since Primary School forty years ago! As always Anne-Marie and the staff were brilliant. Allowing us to place the work we had been doing about the exhibition in the middle of it was fantastic. To see there work alongside the exhibition was a really positive experience for the participants. Long may the relationship continue. 2Create was getting on with some Comic Art Festival preparation as we worked on the Nevi Sport window display. Group members were making more birds and some started making the scenery! The look of the background trees is based on the Magic Roundabout which got everyone talking about favourite childhood TV. The group continued the Comic Art Festival prep. This time the group focused on making the large trees that make up the window display. All our groups are contributing to the display. Some more birds and tufts were made too. An enthusiastic group created word birds for our Comic Fest Window. We use decoupage and other methods to decorate our birds. One participant also worked on a clothes peg snowflake decoration. Very promising. I see us making peg snowflakes in the not too distant future!!! Sculptor Danny Clahane dropped off his piece for the Transformations Project, an absolutely stunning piece. Anne-Marie from Lakeland Art Trust led the group on a fabulous visit to the St Ives exhibition at Abbot Hall Art Gallery. For the last two weeks she has been working with our group at our unit to produce colour inspired paintings and collage. She took these and laid them out in the exhibition which was was amazing for the participants. We looked round the stunning exhibition then. After we experimented with creating moving images in a box using coloured strips. This is something one of the artists, Paul Wynter, had done. A great visit. Many thanks Anne-Marie.